Just out of curiosity, has anyone here heard about the whole Nibiru/planet X thing and the end of the world on December 21, 2012? I'm basically obsessed with it at this point. I find myself researching all the time on the subject (when I'm not baiting of course) Any opinions on this? It was supposed to have happened in 2003 and when it didn't, it was postponed until 2012 when a new date will be announced. ^ ^ ^ Excellent link, I use that site quite often myself. I also agree that the whole 2012 thing is total horse doodoo. Come on, man. Every few years it's the end of the world. Don't you remember the 1999 total solar eclipse over Europe, or Y2K, or 06/06/06? Now this. Yes - a devout Christian who lives near me was saying his goodbyes on 6.6.06 - I laughed in his face when I saw him the next day. If you're "obsessed" with it at this point, seek help. Soon. Before we all die in 2012. In all seriousness, I cannot understand why time after time after time, like the ones listed above, people KEEP ON believing the next time it will happen. Do they have a wish to die? It's madness. What makes this claim so different to 6.6.06 or anything else? ^^ Nothing better than pointing at someone and laughing. Oh Craig, you're totally rad dude. In all seriousness, I cannot understand why time after time after time, like the ones listed above, people KEEP ON believing the next time it will happen. People want to be scared. They want to be part of the mass hysteria. Do you remember (although I'm not sure if you got this across the pond) in the very early stages of this swine flu story, major news networks were coming out with "hundreds already dead" and "an incurable disease". Of course, back then, only a small handful of people had actually died. People do not like being content. They crave fear. EDIT: dnuman: If the Mayans said so, it must be true. People do not like being content. The crave fear. Furthermore, people are easier to control when they are scared. Should I buy Xmas pressies in 2012? More important is it worth stocking up for Hogmanay? I may not that year. I may believe in many weird and wonderful things* but end of the world predictions are not among them. *On holiday I was told that it wasnt rain but tiny unicorns dancing on my tent. One was called Moonbeam. I believe this. My hubby would lie to me would he? El Sid: As true as that is, the thing is that our contemporaries aren't waiting for governments, churches, and cult leaders to instil fear into them. They're doing it themselves. 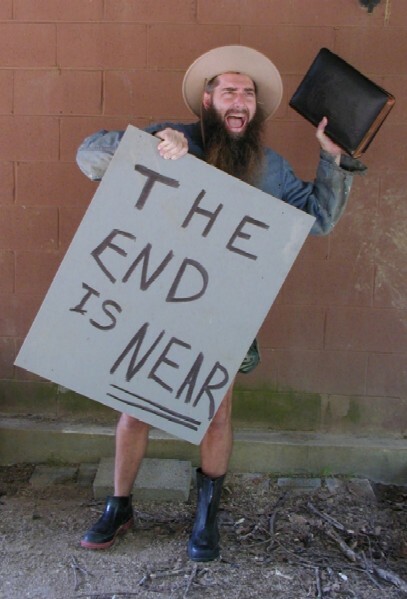 For example, I've not yet heard of a government claiming the end is near. @ NickTheCop: I couldn't agree more chap, I think I was allinging my point more towards to the whole non-entity that is piggy flu (just an example), insofar as it totally works in the interest of authorities and the disgusting lack of responsiblity on behalf of those reporting it in the press and broadcast media (papers need to be sold after all). I think you touched on this yourself. I don't know really, maybe its all part and parcel of the human condition, like life after death, a propensity to feel fear, internalising misery almost as a point-scoring exercise. *Jerry's final though* .... so please, take care of yourself, and each other. I think you really hit the nail on the head there. This is why the only time I watch the news is when I'm sitting at the McDonalds with that blasted TV facing me. A black hole at any distance is gravitationally exactly the same as an "equal mass" of normal matter. If there was any odd radiation from them, we'd be able to detect them a whole lot better than we can. Also note that there is a massive 52 degree difference in declination. In fact the solar ecliptic is tilted in the wrong direction to make this a conjunction. Six months earlier the Earth will be more nearly in line. In fact it is a couple of days after the summer solstice that the right ascension becomes closest, but it is still closer in 2011 than 2012, and it is still six and a half degrees of declination out. "The Horn Blows at Midnight"
Actually the Mayans didn't say anything about the world ending - far less how. Their calendar cycle ended at that point - as it had done before. The end of the world is very much like making love to a beautiful woman....the Earth moves and it climaxes with a big bang in a black hole, and then there is lots of smoking afterwards. For comparison, six degrees is about twelve sun diameters. Mayan scholars do not accept that the Mayans would have predicted the end of the world at the end of the current long calender cycle. The Mayans did record prophetic dates beyond the end of the current cycle, so it seems they expected something to survive. If one is to give any mythological credence to this event, I am put in mind of the introduction to Torchwood: "The twenty-first century is when everything changes, and you've got to be ready." Now you've gone and done it, Thud - you've used actual facts to debunk a conspiracy theory. Facts don't go down too well with proponents of that sort of theory. "The twenty-first century is when everything changes, and you've got to be ready." I'm still waiting. We've finally got flat screen TVs but where's my flying car? The post (5 or 6 down) about the Denver Airport is interesting, if not strange. My daughter was flying out of there last night and while waiting for her flt. was telling me about all of those pictures on the walls. Although I didn't ask what her interpretation was, she would have mentioned an ominous tone to them if she sensed one.